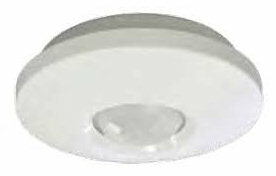 The C-Bus 5754ODPEIR is a new surface mounted version of the 5753PEIRL Multi-Sensor unit. It is a C-Bus PIR Movement Sensor (or Occupancy Sensor), a Light Level Sensor and an Infrared Receiver all in one package. Suitable for many spaces where 'hands free' movement detection automatic lighting is a benefit such as laundries, toilets, walk-in robes, hallways, open plan areas, single rooms, offices and pantries. The unit is Learn Enabled, has a 360 degree detection range of 6-7m. Flush ceiling mount. Low Profile surface mount, suitable for indoor use only and powered from C-Bus.